Australia’s toughest one day cycling race is expanding the opportunities for riders in 2019. Join the action of the Cycling Australia National Road Series and take on this iconic event in the Women’s ‘des Femmes’ race, Men’s Divisions race or ride in the Challenge category. 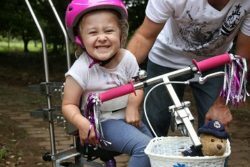 Freedom Wheels builds special bikes for kids with disabilities freeing them to experience the independence and joy of cycling. Do you believe every child deserves the chance to ride a bike? You can give these kids that chance! As a cyclist in the David Reid Homes Grafton to Inverell Cycle Classic you can change the life of a child living with disability. For every $1000 raised, a child can get out of their wheelchair and onto their custom-made Freedom Wheels bike and join you in the thrill of riding. Will you help get kids riding? As of today there are 10 kids waiting to join their friends on their very own bike, we’re hoping you will make that a reality! Please select the fundraising option when entering the event! © Copyright 1961-2019 Grafton to Inverell Cycle Classic. All rights reserved.